PriceCongress is a dubious application to put it mildly. Just like many programs of its kind it is using various misleading marketing strategies in order to deceive unsuspecting users into installing an application that is nothing more than yet another adware. The nice layout of the website and convening slogans often does the trick. Our reports show that quite a few users get their PCs infected with PriceCongress. If you are one of those users, you should know that the removal of PriceCongress is essential and should be executed ASAP as this adware application is associated with suspicious third-parties that could turn out to be malware distributors. Delete PriceCongress using the detailed removal guide that we provide below. Otherwise, you risk infecting your operating system with malware that could be even more dangerous than PriceCongress. 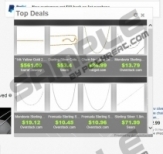 PriceCongress relies on browser extensions to provide adverts within the browser. Thus, once the infection enters your operating system it will instantly install browser extensions to all the popular browsers such as Google Chrome, Internet Explorer, and Mozilla Firefox. After a successful infiltration your browsers will be flooded with numerous third-party commercial adverts and pop-ups that will annoy you to no end. Unfortunately, simple removal of the extension might not stop these annoying activities. But there is another aspect to this infection, and it is the updater that comes along with it. The updater was noticed to be acting as a Trojan that might be able to change your default home page and search engine without your authorization. Thus, PriceCongress could start acting as a browser hijacker as well. Furthermore, it is very alarming that the updater could be used as a gateway to other internet-based infections. It is very likely that PriceCongress will be the main reason other infections are present on your PC. Do not hesitate and remove PriceCongress as soon as possible. If you delay the removal process, you risk infecting your system with detrimental infections that could be harder to delete compared to PriceCongress. Remove PriceCongress immediately. Follow our removal guide provided below with caution, and you should not encounter any problems. However, even one mistake could leave traces of the infection present on your operating system. These leftovers could be just as dangerous as the infection itself. If you suspect that some traces of the infection are present on your PC, we recommend using the list of files, folders, and registry entries associated with PriceCongress that we provide while analyzing your system. If you believe that manual analysis of your PC might be too difficult for you, we firmly advise you to use a trustworthy malware detection and removal tool. Select PriceCongress and then click Uninstall. Then type Control Panel into the command line. Now right-click PriceCongress and select Uninstall. Now select and remove PriceCongress. Quick & tested solution for PriceCongress removal.